We continue to focus on one of the other award-winning projects from the 10th PORCELANOSA GRUPO Awards in Architecture and Interior Design. This time, we highlight the Forward-Looking Projects – Student category, in which the project by Inmaculada Piqueres Díez, from the Advanced Infoarchitecture Master from CICE Madrid; in collaboration with Augusto González Bello, was the award winner. We are dealing with a Work Space or work area with great simplicity and spaciousness, which is on the outskirts of Madrid. 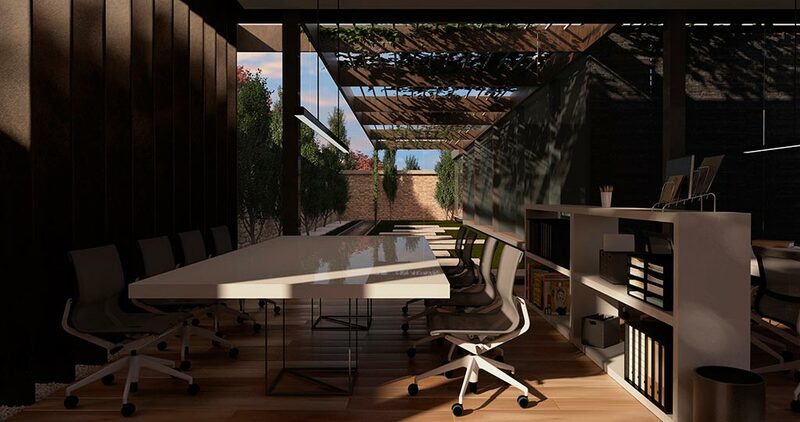 With unique volumetry, this office building is made up of four volumes around a central patio, therefore, seeking a connection with nature. 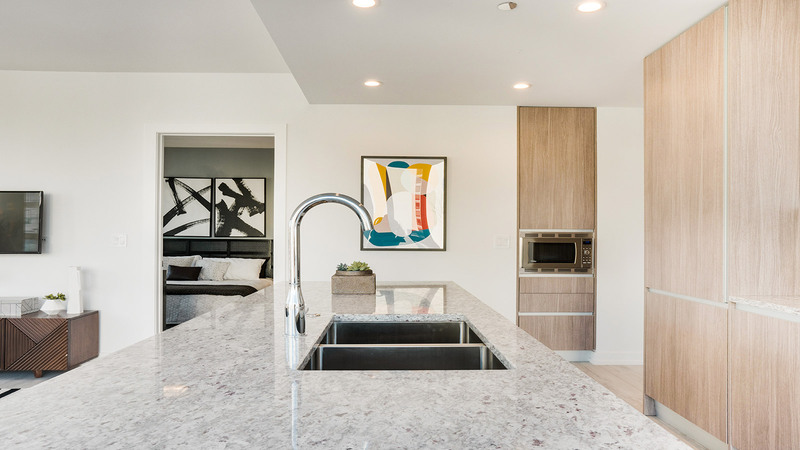 The volumes are focused on the atmosphere, this is the reason why that both high spaciousness and an interior-exterior connection have been banked on. By following plain design lines, the buildings rise up to 30cm above the ground, and they are connected by two plans making up the floor and ceiling. 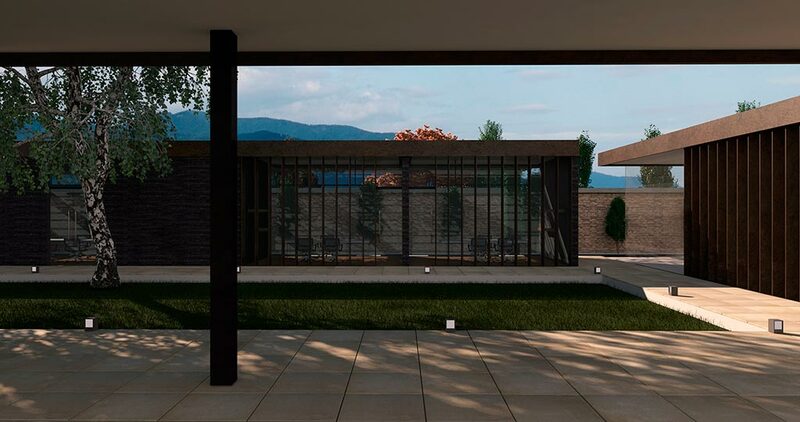 These blueprints make the whole project become connected, and furthermore, reinforcing the horizontal lines and simplicity. Regarding the enclosures, it is worth highlighting that three different systems have been opted for. On one hand, glass, one which enables visual communication among all the parts and a landscape interconnection. On the other hand, a system of slats covered by ceramic pieces imitating weathered-steel that filter the privacy of atmospheres. Last but not least, a stone-facing enclosure has been chosen, which is focused on installations and protection. In this project, Inmaculada Piqueres and Augusto González have opted for plain architecture but with an avant-garde modern touch, as well as warmth. The work surfaces turn out to be spacious and nice, and there is no need to create difficult shapes in order to generate appeal. 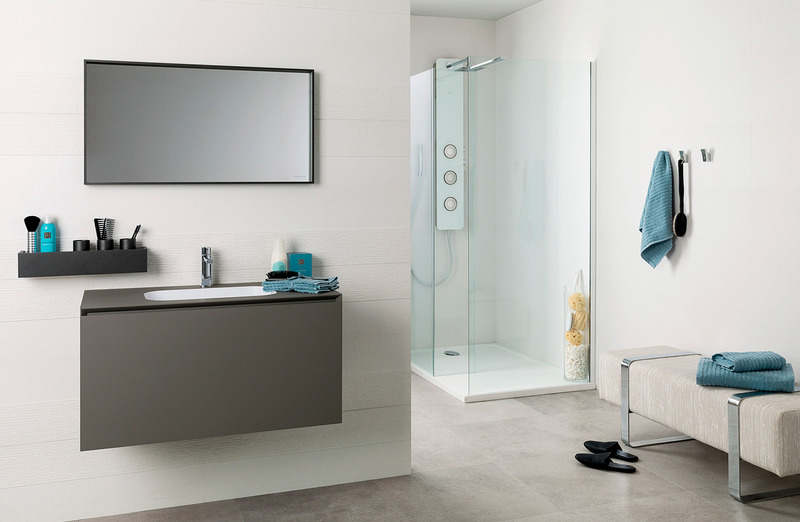 This has a lot to do with the essential use of materials and products from the PORCELANOSA Grupo, whose quality gives higher value to the design, without compromising its smart contemporary aesthetics. 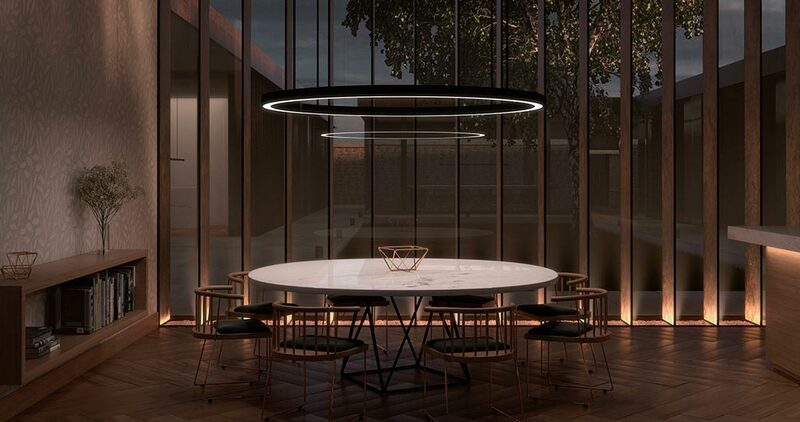 The project has eight spaces in all: a reception hall with a cabinet, a documentation room, bathrooms, a common working area, and a dining room with a built-in kitchen. In this area, the kitchen-diner, the natural essence of the ceramic finishes by Porcelanosa have been the choice, like the Ascot Arce PAR-KER ceramic parquet, which has a natural wood appearance. Classic marble also plays a major role, through the Persian White Pulido natural marble series of L’Antic Colonial for the kitchen worktop and the dining table, both of them custom made and with 30mm stone. In order to achieve aesthetical continuity and enhance that space connection with the exterior, wood effect in interior floor tiles have been the choice for the common working area. The Ascot Teca PAR-KER matches perfectly with the purest finish of the KRION® Solid Surface mineral compact, in other words, the 1100 Snow White, used for the working tables because of its versatility and countless properties. With regard to interior design, it is also worth highlighting the use of the decorated wall tiles by Venis. The project dining room exudes exclusivity and originality through the Dalia Blanco ceramic wall tile, with texture and leaf-shaped relief. As far as the exterior is concerned, highly-resistant and durable materials which undergo unfavourable weather conditions and with an easy maintenance have been the choice. Apart from the Globe Stick Bhutan series of L’Antic Colonial for the covering of the exterior faces, one can find the XLight in a rust finish, like the Nox Corten Nature by Urbatek. However, with regard to the flooring, the cement finish is the choice, through materials such as the Dover Arena STON-KER ceramic stone by Porcelanosa. 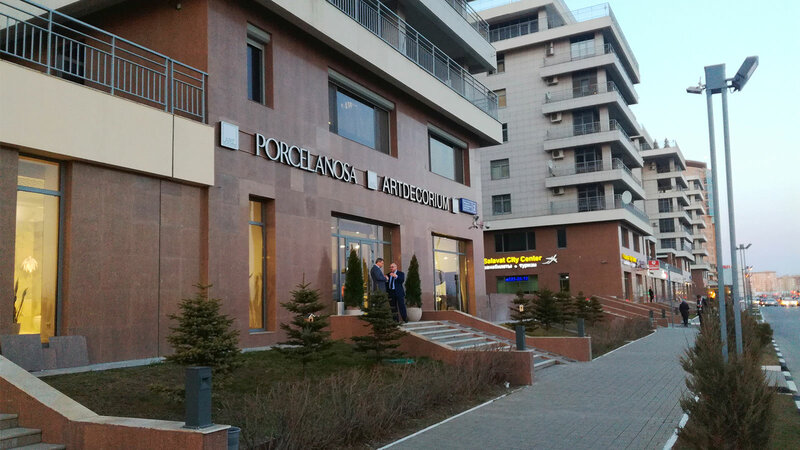 We are dealing with a modern project that is daring, which embraces the working team and amazes everyone because of its outstanding volumetry. Modernity in its shape which contrasts with the authenticity and the natural connection to the exterior.